Listen to an excerpt from The Write Questions on KUFM - Montana Public Radio. During this program, William J. Cobb talks about and reads from his novel ‘The Bird Saviors.’ He also gives some background information about his research into the government’s Department of Nuisance Animals. When a dust storm engulfs her Colorado town and pink snow blankets the streets, a heartbreaking decision faces Ruby Cole, a girl who counts birds. She must either abandon her baby or give in to her father, whom she nicknames Lord God, and marry a man more than twice her age who already has two wives. She chooses to run, which sets in motion an interlocking series of actions and reactions, upending the lives of an equestrian police officer, pawnshop riffraff, a disabled war vet, Nuisance Animal destroyers, and a grieving ornithologist who is studying the decline of bird populations. All the while, a growing criminal enterprise moves from cattle rustling to kidnapping to hijacking fuel tankers and murder as events spin out of control in a world in which the social fabric and economic structures seem on the verge of falling apart. 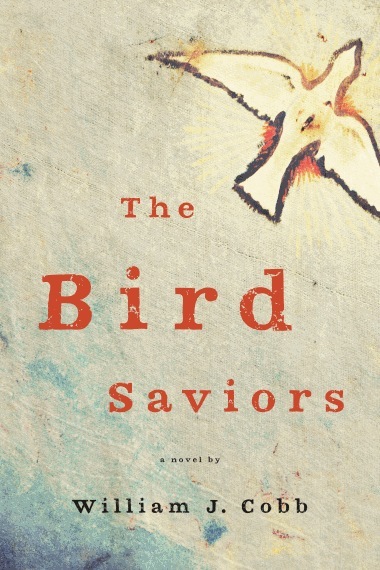 Set in a time of economic turmoil, virus fears, climate change, fundamentalist cults and illegal immigrant hardship, The Bird Saviors is a visionary story of defiance, anger, compassion and unexpected love, in which a young woman ultimately struggles to free herself from her domineering father, to raise her daughter in the chaos of the New West, and to seize an opportunity to become something greater herself. In this brilliant new novel, William Cobb offers an elemental and timely vision of resilience and personal survival, but—most of all—of honest hope. Lord God is talking again. He does love to hear himself speak. A graybeard loon, he sits hunched over the kitchen table, his arms sunburned, nose hooked, hair thin and wiry, ranting hoarse-voiced about sinners and Socialists. Out the foggy window Smoke Larks flutter liquid as living shadows to perch atop the woodshed. When they settle the morning sun backlights their black silhouettes like burnt figures on a woodcut. Ruby shifts the baby girl in her lap and thinks of the birds, how they must be cold of a morning like this. She’s seen twelve this week whole. She counts the birds and invents her own names. She knows that people call them by another name, but she calls them Smoke Larks. Swirling in vast flocks in late winter, they look like smoke from a great fire, burnt souls twisting in the wind. Purple-black, dusky, and speckled, the short-tailed birds scatter among the twisted junipers in the back yard, pecking in the dry hay grass. Ruby began counting all the birds two years before, when she noticed how quickly they seemed to be dwindling. They are disappearing and someone has to note this, to keep it in her mind if nowhere else. The going away of things has to be noted. Especially a thing as perfect as a bird, even the squawky Blackjacks, or an old Grief Bird with claws like voodoo earrings. William J. Cobb is the author of a book of stories and two previous novels, including the critically acclaimed Goodnight, Texas. His short fiction has appeared in The New Yorker and many other magazines. He has received numerous awards, including a National Endowment for the Arts grant, a Dobie-Paisano Fellowship, and the Sandstone Prize. He was raised in Texas and currently lives in Pennsylvania, where he teaches in the writing program at Penn State, and in Colorado. Author photo by Elizabeth May.